Posted on April 4, 2019 at 9:14 am. July of this year marks the 9th year anniversary since Google bought the software company ITA who had built the reservation systems for the likes of Orbitz and Hotwire. This acquisition was at the heart of their move into the flights market, and Google launched Google Flights in September 2011. At the time this was huge news in the travel industry with a large amount of speculation that they were going to shake-up the market and deliver a hammer blow to OTAs. The reality was somewhat less dramatic. Growth was steady, but it wasn’t until 2017 that Google Flights really started to make its mark, particularly in the US market where unique visitors to the site jumped to over 6 million in January of that year (compared to 4.3 million in Jan 2016 and 2.1 million in 2015). Since then Google Flights has established itself as a key competitor to the likes of Skyscanner and Kayak. 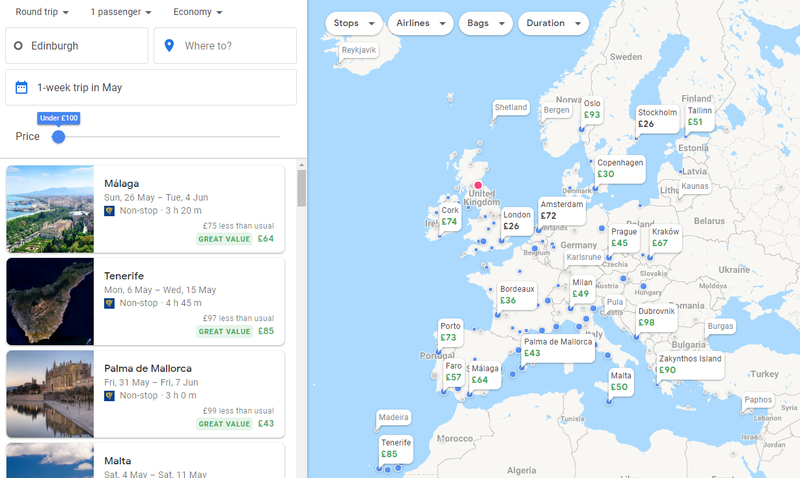 New features get rolled out regularly, including the most recent “budget cap” feature within “Explore Destinations” that lets users enter their maximum budget, origin airport and dates of travel to see how far their finances can take them. Considering the amount of attention Google got when the Flights product came to market, it is fair to say that the launch of Google Hotel Search last month was a much lower key affair – but it certainly has the potential to impact the industry a lot faster. 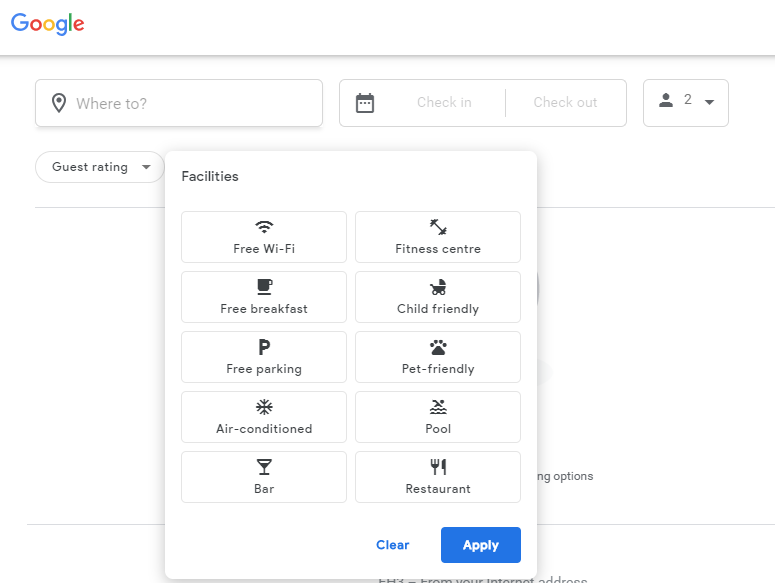 The product offers all the key features you would expect; search functionality by destination, dates, number of guests and a range of useful filters such as hotel star ratings, guest review ratings and facilities (similar to Airbnb functionality in particular). Another interesting feature launched last week was the ability to search for “Holiday Rentals”. Providers participating in this include TripAdvisor and Expedia but the big question will be around whether AirBnB signs up also? Having a single site where users can search for rentals and hotel rooms is likely to become a huge competitor for AirBnB so their response is going to be very interesting. 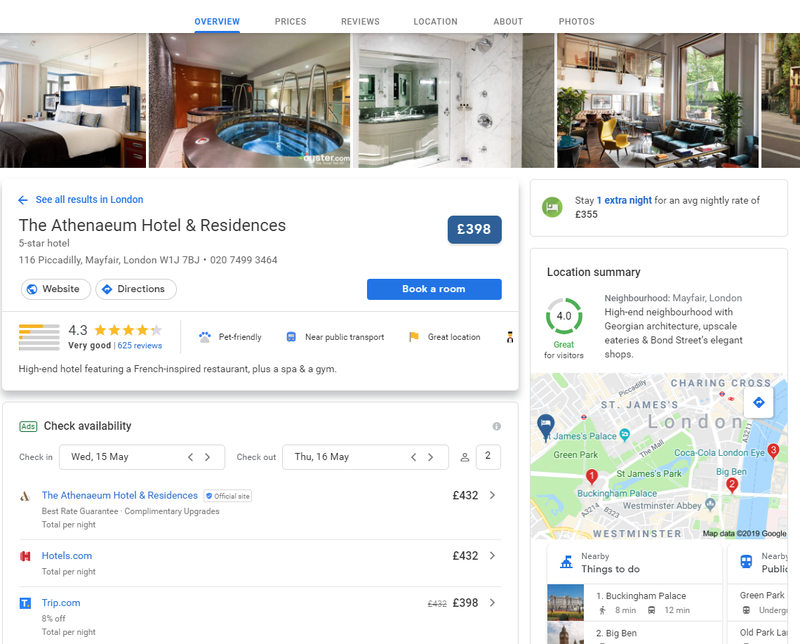 One of the big advantages of appearing highly within Google Hotel Search is of course the product integration with Google Maps and how highly this appears within the search listings. Hotel owners are likely to take this move by Google extremely seriously – especially with the increasingly competitive marketplace they are operating in. Average CPCs for core hotel keywords (such as hotel <location>) continue to rise year on year and visibility within the organic listings is becoming an increasing challenge, particularly on mobile. In summary Google’s timing seems perfect. With the industry set to spend close to $10 billion in digital advertising in 2019 and the battle to appear above the fold for hotels fiercer than ever, Google wants to ensure it stays front of mind for all travellers. What are the key things I need to do as a hotel owner? When clicking through to a specific hotel, a Google Hotel Search user is presented with various bits of information including prices and reviews, facilities and the exact hotel location. As a result, there are several areas that can be looked at to ensure your property is as competitive as possible. Metasearch partners such as Derbysoft and Triptease can also ensure your prices appear here. Google has become by far the most important platform for metasearch with Google Hotel Ads representing 65% of all their bookings in 2018. Already an important factor for local optimisation, ensuring that your Google My Business page is updated with information such as amenities, address, highlights etc. is going to be key. Overall, Google Hotel Search is certainly here to stay and it is going to make for an interesting watch how it impacts the hospitality sector across the remainder of 2019.